FREE SHIPPING on orders of $49+ with code FREE49 for a limited time. 15% OFF Popular Aquarium Supplies through 8.1.11 or later. $10.00 off on purchase over $75. Limited time only. Get Free Shipping on orders over $75! Oversize shipping fees may apply. $25 OFF orders of $150+ for a limited time. Get up to 60% Off Pet Supplies. FREE SHIPPING for orders of $49 or more with code: 49FREE for a limited time. Some exclusions. Get free shipping with $100 purchase. 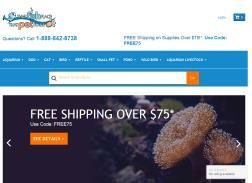 Get Free shipping to US 48 on aquarium & pet supply orders $75+. Oversize shipping fees may apply. Get $5 off $50. Discount based on pre tax total. Limit one promotion code use per customer. 15% off Aquarium filters, bulbs & lamps, cleaning supplies, decorations, food, lighting, Protein Skimmers RO filters/deionizers, UV sterilizers. Get Free shipping on livestock orders over $149. Get $10 off $100. Limit one promotion code use per customer. Earth Day! Get up to 65% off sitewide.